How Much Does Is Cost To Install A Backyard Water Fountain Or Waterfall? Homeowners pay an average of $2,572 to install a backyard fountain or waterfall. Project prices typically range from $973 and $4,352 but can cost as little as $50 or as much as $8,000. Depending on factors like the size, complexity, and material, expect to pay between $100 and $4,000 for the precast unit, excluding installation. Pool waterfalls run an average slightly above $1,000. If you want a fountain to enhance your lawn and garden but worry about the price, don't! One can be built at a reasonable price, and it requires very little upkeep, recycles the water that runs through it, and can even add value to your home. The price of a fountain itself will range from $50 to more than $4,000. Exact project price will depend on the material used. You can find a simple garden fountain or birdbath at a hardware store for very little money. Or you can install a full-sized waterfall cascading over a marble wall for thousands of dollars. Any way you want it, there is one that will meet your needs and your budget. Some models will cost more to install than others, depending on the features you select and how difficult the unit is to install. A medium, 12-square-foot pool waterfall made of rock averages about $1,000, including installation. A small DIY kit can be as little as $450, while a larger grotto-style unit with lights and a fire feature can cost as much as $18,000. Adding to a swimming pool requires working with your pools existing features and landscape. A professional will consider your pools mechanics, drainage, masonry, pump system, and filtration. Contact a pool professional for a custom quote. Pool grottos usually run from $5,000 to $10,000 or more. Grotto structures provide overhead shelter, like a cave with a built-in bench. Waterfalls typically cascade over the top of the structure. Custom faux rock features range from $1,000 to $7,000, not including installation. A licensed contractor or pool company can provide a quote for custom Rico Rock features. Typical installation rates apply. These range from $1,500 to more than $5,000, depending on size and type of rock work. Also known as cascading waterfalls, these standalone structures boast some advantages over other models. Space - These can be small, so you can build them anywhere in your front or backyard. Safety - No pond means you dont have to worry as much about water safety. This option is perfect for homeowners with pets and/or small children. Cost - Most pumps operate on a timer to run only when you are home, saving money on energy bills. Maintenance - Simply fill the reservoir every few weeks as needed or install an automatic fill valve. In general, the cost of installation is likely to be similar to that of the fountain itself. Waterfall companies, pool companies, and pond builders will charge $40 to $65 per hour to install. Complete installation, including any necessary plumbing and electrical work, will take a minimum of 1 day, or 8 hours, at a total price of $320 to $520. Whether you choose a small bird bath or a large backyard centerpiece, the size and height of your structure will be the main price factor. Indoor fountains usually cost less than outdoor models due to their smaller size, easy installation, and lack of maintenance. Simply fill a tabletop or floor fountain with water, plug it in, and turn it on. No plumbing, electrical, or site prep is necessary. Because indoor units arent exposed to the elements, occasional wipe-downs and refills keep them running smoothly. If you choose to install on your own, you should still use professionals to set up plumbing and electrical components. You can hire a professional plumber at a rate of $45 to $65 per hour. Hiring an electrician will run $65 to $85 per hour. The actual rate for a plumbers services will depend on the distance your fountain is from a water source. Similarly, the distance from it to a power source will determine how much an electrician will charge. Another price factor to consider is how much water and electricity it requires. Expect to pay anywhere between $50 and $200 for solar fountains. The price of these models may be higher than a non-solar units of similar size and style. Small, simple solar fountains will be at the lower end of the price range, while multi-tiered versions will be at the higher end. However, the amount of money you save on operating costs offsets the initial investment. These units can save you money on energy bills. Exact savings will depend on the wattage of the pump, how many hours per day it runs, and the rate of electricity in your area. No additional charges should apply to building into your existing landscape unless you require significant work. The cost to reslope a lawn, for example, can range from $1,000 to $3,000. In some cases, there may be an additional cost to excavate your land or an extra cost to install a pond. If large amounts of your property need to be dug up and paved or tiled over to accommodate your fountain, you can expect the cost to clear and prepare the construction site to far exceed the price of the fountain. 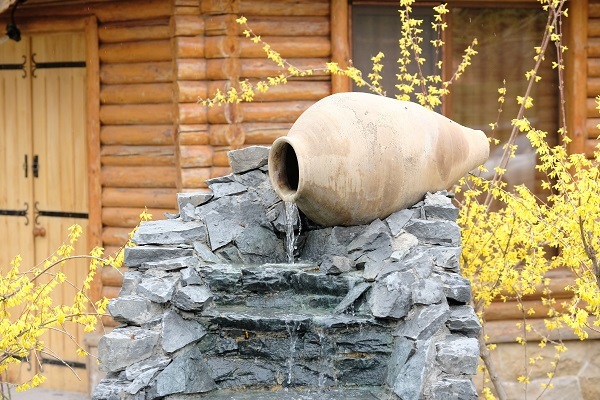 Water features can increase curb appeal and resale value. However, fountains must be clean, function properly, and match the style of the home. Because they are easy to maintain and do not pose a safety hazard, prospective buyers typically view them as an asset. If ROI is a primary concern, consider hiring a professional to ensure it will last. The cost of an indoor drinking fountain typically falls between $1,000 and $2,000, while an outdoor version runs between $1,000 and $3,000, including installation. Non-traditional, artistic fountains can be $4,000 or more. A plumber will charge an hourly rate of $45 to $150 or a flat rate of $160 to $430 for a typical job. A homeowner with plumbing and electrical knowledge can install his/her own basic water feature. When plans involve a more elaborate structure like a grotto, complex details like lighting, or significant site preparation like excavating, its usually better to consult a fountain professional to design and install a beautiful and functional garden waterfall. A variety of contractors to select from.